Acorn Sales Company and Mid-Atlantic Mobile Notary Services, Inc., partnered in 2007 to offer quality notary supplies and a variety of notary classes. All trainees receive a 20% discount coupon during class. 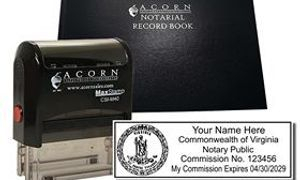 Notary supplies can be ordered online at www.acornsales.com or at Acorn's location, 1506 Tomlynn Street, Richmond, VA 23230. What's in your Notary Instructor's Bag? What is in your Notary Instructor's Bag? I like alternating my stamps. I use two seals whenever possible. One self-inking notary stamp which is photographically reproducible and is state compliant. I also use an embossed seal which makes a raised impression. I do not darken this seal because I am already state compliant by using a stamp. I use the undarkened raised impression as a deterrent to fraud. At the same time, I offer the traditional raised seal as a courtesy to my clients. Folder with important Virginia notary certificates that I may need at a mobile assignment. Bryce Hall, Notary Instructor, is not an attorney and does not give legal advice.